Couture has always been a playground for me. A place of overindulgence, luxury, and most of all, individuality. 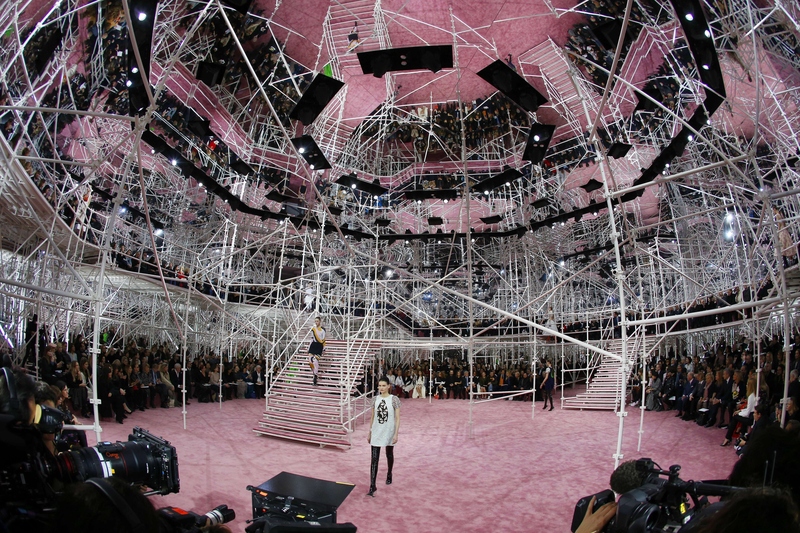 And this past Monday, Dior did not disappoint with their Spring/Summer 2015 Couture Show. Creative Director Raf Simons sent his models down the runway wearing floral patterns, eccentric prints, and robust silhouettes. One look in particular — Look #53, to be exacty — had its own debut. Refinery 29 and fashion publisher Visionare created a video showcasing exactly how a couture dress comes to life, from the moment of inception to its grand introduction at the tent at Musée Rodin. The four and a half minute video shows how the intricate dress is made—from the cutting of patterns to the meticulous art of creating pleats (which by the way, looks awesome). By-hand dip dyeing and sewing are just a couple of the painstaking steps in the long process that could take up to six months. One of the women working on the dress even says, "these stripes will drive us crazy." I'm with you on that, sister. And after a car ride and a fitting, Look #53 was presented to Simons and styled appropriately. The video also gives us a sneak peek backstage before the show, with a frenzy of make up artists and hair stylists getting the models prepared for the runway. And finally — we get to the show. The venue was set up to look like the inside of a kaleidoscope, with scaffolding running throughout the tent. Models zig zagged their way through, and Simons' inspiration of historical references from the '50s and '60s come to life. Simons especially wanted to pay homage to David Bowie, telling Style.com that "he's a chameleon, able to reinvent himself. But he's also the materialization of something else. More than a man—an idea." It's no wonder a couture dress costs a fortune—the hard work and blood, sweat, and tears are costly. But can you really put a price on magic?